The first time I went to the supermarket as a newly minted Metro Manila resident, I threw items into the shopping cart as if our old SUV was in the parking lot, waiting to haul two weeks' worth of groceries home. Only after I had paid and was staring at eight bags with the combined weight of a full-grown man did I remember having walked to the store. Later, as I glared at modestly sized cupboards that refused to hold any more jars and cans, it was easy to blame our compact space for being too small. But the truth was that my old buying habits were simply too big for our new home. The kind of Big Box shopping so familiar in America seems to have been duplicated here in the Philippines, except it's not quite the same experience. Manila does have its share of large supermarkets and one-stop shopping centers alarmingly dubbed 'hypermarkets' (essentially mall-sized SuperTargets), as well as a chain of U.S.-style warehouse clubs. But while these stores offer an enormous variety of goods, the idea of bulk or bundled purchases is relatively expensive, uncommon, and impractical for many Filipinos. At first, I was thrilled to discover S&R, the local version of Costco, until I realized that unlike Costco’s original value-oriented concept, S&R is a high-end retailer full of imported goods that are priced well above my everyday budget. Likewise, the supermarkets here are often attached to shopping malls and frequented by more affluent consumers; none could be considered 'neighborhood' markets. 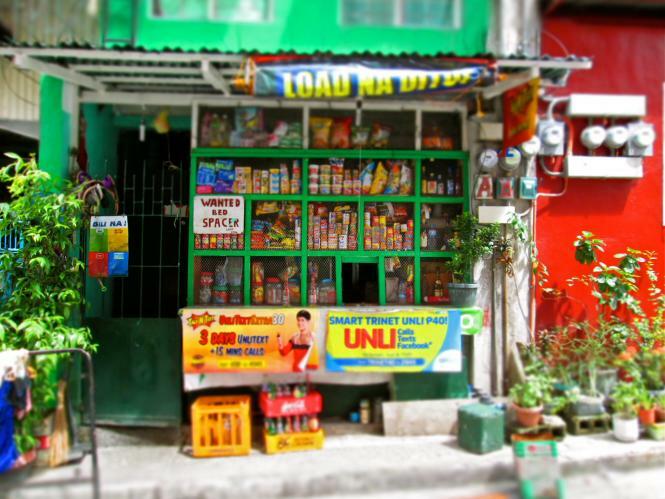 Instead, most Filipino consumers rely on more traditional stores for their daily necessities. Independent vendors in municipal and neighborhood palengkes, or wet markets, provide fresh produce and meat to local residents, while tiny home-based sari-sari ("variety" in Tagalog) stores dot every street, offering basic items from candy to laundry detergent. Purchases at these businesses are measured in grams and pieces, not in pounds or by the dozen. One reason for shopping small is simply the shortage of storage. 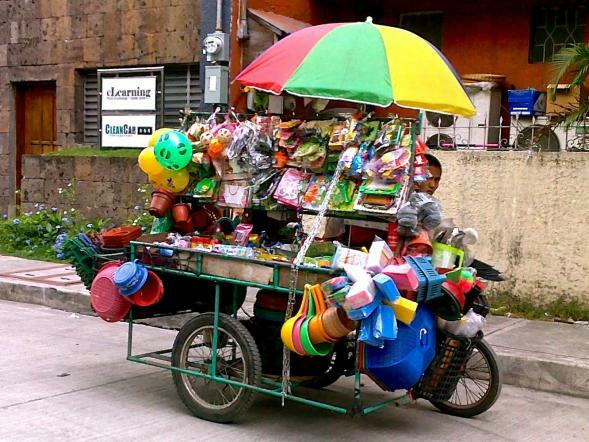 Finding whatever you need or want is easy in Manila; finding space for it at home is the sticking point. Although the city's skyline is bristling with high-rise condominiums, the actual units inside are closet-sized compared to American housing. A studio averages 30 m² (approximately 320 ft²) while our 65 m² one-bedroom is considered quite large. A spacious single family home is a luxury in a metropolitan area where cramped households of extended family are the norm and impoverished shantytowns proliferate. Furthermore, the underlying principle of bulk buying - the more units per product purchased at once, the cheaper the per unit price - may be appealing to budget-minded Americans, but the higher initial outlay of money doesn't seem like much of a bargain to a Filipino earning an average monthly wage of US$279 (compared to the U.S. average monthly wage of more than $3000). Between the limitations of space and income, economies of scale are more a concept than an everyday practice in the Philippines. Big-Box shopping is an idea that may now be past its peak in the U.S. as well. According to some reports, Big-Box buying is on the wane as continued economic sluggishness and smaller households combine to diminish the appeal of stockpiling goods from cavernous stores. Not to mention consumers’ growing desire for more community-minded interaction with producers, particularly when it comes to buying food. · Back to Basics: To maximize my limited kitchen space, I rely on fewer appliances and specialized tools. A good set of knives and a sturdy cutting board, for instance, have replaced my big food processor and allowed me to sharpen - pun very intended - my knife skills. · Lose the Bulk in the Pantry...: Unnecessary waste is the hidden shame of bulk buying. I confess to throwing away food because they expired faster than I could use them up, or were hidden in the dark recesses of the pantry. Instead of buying for what I think I could use in the future, I now buy only what I know is needed for the next few days. · ...And Around Your Waist: Behavioral economist Brian Wansink wrote in his book Mindless Eating that people with stockpiled or extra-sized packages of food from warehouse clubs have a tendency to eat them at twice the normal rate, in large part because the food is abundant and conveniently within reach. We all know how this story ends. · Closer to Home: Lack of storage space blunts the urge to stockpile pre-packaged ingredients. Instead, I've been using more fresh ingredients, like produce from nearby farms and seafood caught just that morning. Of course, these foods are highly perishable, necessitating more frequent trips to the grocery or palengke, but the time and energy is well spent on quality ingredients and reduced waste, with the added benefit of really getting to know my adopted community. Tracey Paska lives, eats and writes in Manila, Philippines, where she revels in the fact that she can wear flip-flops outdoors in January. When she's not exploring Manila's foodscape, she freelances for a national food magazine and writes about the complex and fascinating connections between food, culture, and society on her blog Tangled Noodle. Follow her at @TangledNoodle. Her last article for us was Turning Over a New Leaf for Asian Flavors.